Kihei Sands Beachfront Condo A11 on Maui's Beautiful Sugar Beach! Aloha and Welcome to Kihei Sands Beachfront Condominiums Condo A11 in sunny South Maui! Condo A11 has a remodeled kitchen with granite countertops, new cabinets, new living room furniture and new Mitsubishi A/C in the main living area. Kihei Sands Condominium sits directly on one of Maui’s best beaches, Sugar Beach. From our oceanfront pool and barbecue patio area you can practically touch the beach - clean, sandy, unpopulated, and stretching for miles in either direction. How far is it to the beach? Literally around 6 feet! Our Patio and lawn areas are idyllic. Enjoy each morning with fresh brewed coffee and each evening watching a spectacular Sunset while you grill dinner and sip a beverage. Kihei Sands is a special place full of the Aloha spirit. Our intimate layout provides the perfect location for reunions, group getaways, honeymooners, seniors, families, couples and friends. With 23 units to choose from it’s easy to find the perfect fit for everyone in your group, from number of bedrooms (1, 2 & 3) to bed configurations. A short walk down the beach you’ll find several eateries and shops, including a Fresh Produce Market, ABC Store, Bakery, Shave Ice, and a small diner. There are numerous dining and shopping options within a couple miles of Kihei Sands. Our central location makes it easy to access all that Maui has to offer. Come stay with us on your next vacation - share in the beauty of Maui and the relaxing atmosphere here at Kihei Sands Beachfront Condominiums. Kihei Sands is paradise on Maui!! My husband and I stayed in A11 during the last week of March, 2019. The sandy beach, the ocean views. and the wonderful people all helped to create a fabulous vacation spot! Kihei Sands is very close to many other restaurants, tourist spots, and shops. A11 is a very nice condo with all the amenities you need to make it home for your stay. It is clean and well kept. The view from the patio is very pretty as the sun sets beyond West Maui Mountain. Connie, the manager, and her team do an excellent job to make everyone feel welcome and happy! She is terrific and helps with anything she can. We would definitely recommend Kihei Sands to anyone looking for a beautiful vacation spot on Maui! We are beyond pleased that you enjoyed a 5* stay with us and gave us such a lovely recommendation! Many mahalos for your superb description of our little slice of Paradise! Very nice condos and location is perfect! Thank you! We are pleased that your large family enjoyed both condos, and our indisputably perfect location on Maui's best beach! We hope to host your get-together again the next time you return for an island vacation. Sending much aloha your way til then. The property location and description were exactly as described. Cannot beat being steps away from endless sandy beaches. Small boutique property, with friendly guests. A11 itself was very small but as described. The TV has a large white line thru it but did work. The beach supplies were great. I did feel that A11 could have been cleaner (could barely see out the windows, curtains were stained). Towels were pretty much on their last legs as were the bed linens. Mahalo for taking the time to share your feedback from your recent visit to our resort. We appreciate your comments and strongly value our guests' feedback as we are always looking for ways to improve our guests' experience. We have shared your remarks with our management team as well as the owners. We have already received and replaced all linens and towels with new inventory. We had just done our twice-yearly window cleaning in early February, however our unusually wet and windy weather the entire month of February did take its toll in a matter of days. We hope to welcome you back in the future and exceed your expectations. Warmest aloha coming your way! We have been coming to Kihei Sands since the 1970s. The exterior of the building and grounds were in great shape. We love the view and the beach, but the units we have stayed are deteriorating and need a lot of updating. It was like staying in an old hotel room. Appliances, furnishings, painting, need replacing as well as bedding and curtains. The manager Connie was great! The individual owners don't care because their units stay rented all the time. Aloha and mahalo for your honest review. We do appreciate feedback that is specific and detailed, because that gives us the opportunity to make improvements that all future guests can enjoy. We will be in touch with the owners and will be facilitating improvements and remodeling in the very near future. We take our guests' recommendations to heart, and it is our goal to grow our 'ohana with repeat and long-time guests such as yourself. We are committed to making Kihei Sands the only spot that people consider when deciding where to spend their island time, and while many (if not most) of our units have been completely remodeled, we do have are few areas left to concentrate on. We will be working hard to earn back your business! 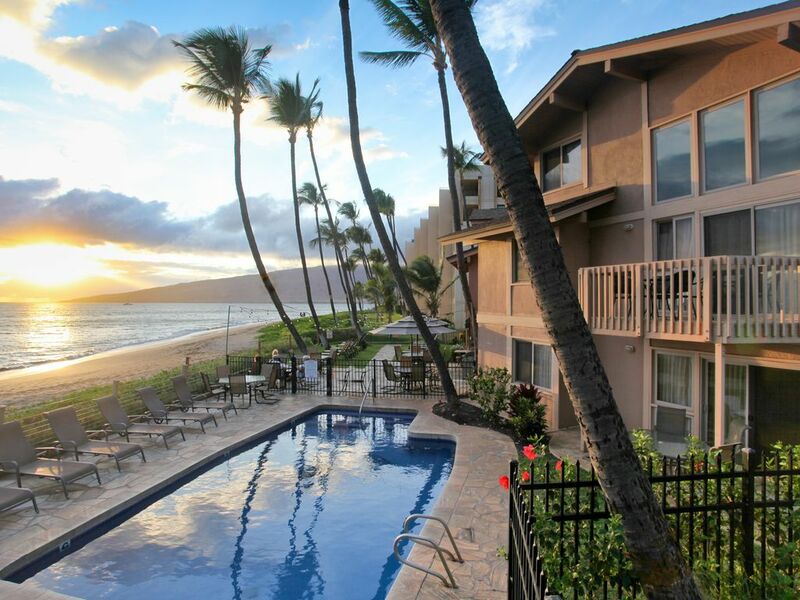 Kihei Sands will continue to be the best vacation property available, as our owners and staff take pride in providing a fabulous vacation experience to everyone who is looking for an affordable, exceptional stay. Many mahalos and much aloha from our 'ohana to yours! We loved having you stay with us for your island vacation. Mahalo for your 5 star review! We hope you come and stay at Kihei Sands again soon. In the meantime, much Aloha heading your way! This was our 2nd time to stay at Kihei Sands. Every step of the rental process was professional and very organized. Great location! I would suggest, if you have a late flight go ahead and rent the condo for the extra day at the time of the rental. It will help. Checking out at 100 a.m. and flight at 7p.m. was tough. I will plan better next time now that I know! Already planning our next visit! Mahalo for your review and thanks for your suggestions. We love our returning guests and look forward to having you back again in the future. Until then, much Aloha heading your way!